Overall, this has been an amazing trip and experience. I truly believe it is due to having an excellent tour guide. We are very grateful to have had Hiroko as our guide and Ketano as our driver. We will definitely recommend this tour and company to friends and family. 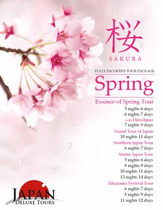 Thank you very much Japan Deluxe Tours! It was good that most were modern and offered western amenities. We were able to experience authentic and traditional Japanese cuisine. Hiroko was an amazing guide!! She is very knowledgeable and patient with us as we had many questions. She is also a great story teller and very fluent in English. We were able to visit and experience both traditional and modern sites.